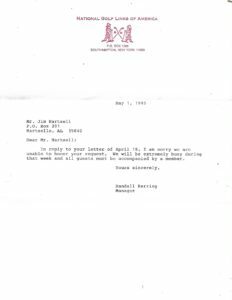 As a naive young Architect and golf course architecture enthusiast, a year after my first visit to the great links courses of Scotland, I wrote to the National Golf Links of America requesting that I be allowed an hour or so to walk the course while I visiting Long Island for the first 2 rounds of the 1995 Open at Shinnecock Hills. It was an impassioned letter about my interest in historic golf clubhouse design and the courses of Charles Blair McDonald. I humbly requested any time Monday through Wednesday of that US Open week just to be allowed to look around the historic American golf course, not even play. To their credit, I did receive a short response letter explaining that they would be unable to honor my request. In fairness, I am sure it was a very busy week for them. However, the irony of that correspondence has always stuck with me over the years. In perusing the current ranking of the Top 100 Golf Courses in the World, I was proud to find out that I have played exactly 16 of them in my lifetime. 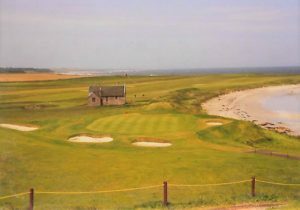 I have been fortunate enough to play #100 (Prestwick), #88 (Machrihanish), #77 (Cruden Bay), #64 (Kingsbarns), #61 (Royal Lytham & St. Annes), #51 (North Berwick), #47 (Royal Troon), #35 (Lahinch), #28 (Carnoustie), #17 (Ballybunion Old), #16 (Turnberry), #15 (Royal Dornoch), #14 (Royal Portrush), #10 (Muirfield), #4 (Royal County Down) and #3 (The Old Course). Curiously, all 16 of these great links golf courses are located in the UK or Ireland. I am a lifelong golfer and resident of Alabama, USA (other than a few years living in Mississippi while attending Mississippi State) and yet I have never played a single one of the top 100 courses located in the United States. At this point in my life, I have come to the realization that I most likely never will. In my mind, the ultra-exclusive nature of these clubs has always been a major problem with golf in America when compared to the game of golf in the British Isles. I have nothing at all against private golf clubs. In my line of work, I have been fortunate enough to get invited to play at some of the best private golf clubs in Alabama many times over the years. Almost without exception, I have been treated exceptionally well as a guest on these occasions. A few weeks ago I was invited to play in a Member-Guest at what I feel is one of the best all around golf clubs in the United States, The Country Club of Birmingham. They have not one, but two, Donald Ross courses! The West Course has been modified heavily by Pete Dye and others over the years, but the routing is still basically all Donald Ross and it’s great. The shorter East Course is more or less still all the original Donald Ross layout, including the green complexes, and is a delight to play. I am extremely grateful every time I get invited to play at this club. It’s an incredible place. However, I can’t help but think that I’d never have set foot out there it if I didn’t happen to meet various friendly members through my work. In the United States, the vast majority of great private golf courses are strictly private. Visitors are never allowed to play unless accompanied by a member. I love the attitude regarding the game of golf in Scotland and Ireland, and to a slightly lesser extent England. Golf is considered more of a “democratic” game in the UK. 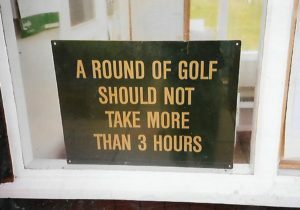 The great high temples of the game such as Muirfield, Prestwick, Royal Troon, Royal Dornoch and Royal County Down actually allow a limited number of visitors to play on selected days. In the case of The Honourable Company at Muirfield, it has traditionally been on Tuesday and Thursday. It is not easy to do, and requires written correspondence up to a year ahead of the proposed dates, but playing Muirfield should not be easy. However, a boy who grew up in Tarrant City, Alabama was able to write to the Secretary of The Honourable Company of Edinburgh Golfers at Muirfield, secure a tee time and play 36 holes (with the best lunch I’ve ever had) at arguably the greatest golf course in the world. 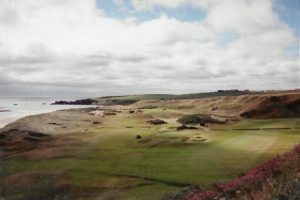 The more “artisan” clubs like Machrhanish, Cruden Bay, Crail and Connemara welcome visitor play almost any day of the week, although there are blocks of times reserved for members only, as there should be. In my experience, the welcome afforded to visitors, and the general attitude about golf at these clubs, is only matched in the US at places like Sweetens Cove GC. At Machrihanish, a member will stop you after a round and ask how you got on in your round, much like might happen to you coming off #9 green at Sweetens Cove. In Scotland and Ireland, it’s more about the pure experience of playing golf. Imagine what it might do for golf in the US if clubs like Sand Hills, Cypress Point, Pine Valley and The National Golf Links of America allowed just one day a week, or maybe only one or two days a month, for visitor play, like all the great clubs of the UK. From all I’ve read over the years, many of these courses are largely deserted during the week anyway. How many times have you read the account of some fortunate golf writer who has been able to get on Cypress Point say that they were the only group on the entire course that day? I realize it’s easy for me to propose such an idea for golf clubs where I’m sure the members pay a fortune for the privilege of playing there, but it still makes sense to me. These ultra exclusive clubs obviously do not need money, so maybe they could take the income from the 4 visitor days each month and donate it to growing the game initiatives run by the USGA and PGA. 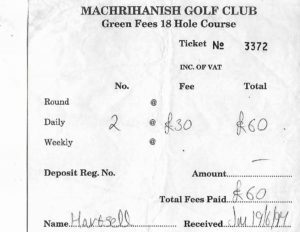 They could make the process for obtaining a tee time as formal as a place like Muirfield does, or as easy as calling Ken Campbell in the pro shop at Machrihanish. I would be fine with either approach. I have been spoiled by being able to play a fair amount of golf in the UK when I was younger. Honestly, it made me not enjoy playing as much at home in the US the last several years, because the game is so vastly different. Discovering Sweetens Cove and learning that there are people out there that value the UK golf methodology has given me a renewed interest in actually playing the game. You can play 18 at Sweetens Cove easily in 3 to 3.5 hours. You are almost always moving, which is how golf should be played. Pace of play in Scotland is revered to the point that I have actually seen Scots scream at the group on the green ahead of them (often Americans unfortunately) if they feel they are taking too much time to play. It’s not the main point of this article, but we could also take a major lesson from the UK on pace of play. Maybe at some point the general approach to visitor access to golf courses in America will change, if one great club like Sand Hills in Nebraska chose to start a trend. As much as I hope for this to happen, normal golfers like me will likely never get a chance to play at a place like the fabled The National Golf Links of America. However, I do not feel it would be inappropriate to ask them to change their name to something more fitting….perhaps The Private Golf Links of Southhampton. Note: All blog photos by author.